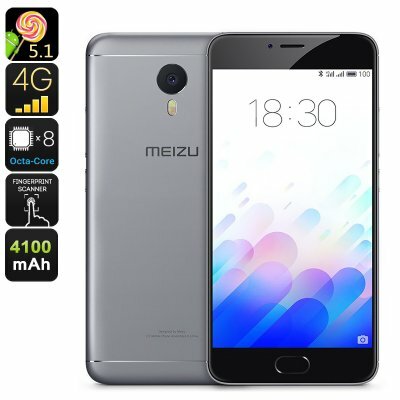 Successfully Added Meizu M3 Note Android Smartphone - 5.5-Inch FHD Display, Octa-Core CPU, Fingerprint Scanner, Google Play, Dual-IMEI, 4G (Gray) to your Shopping Cart. The Meizu M3 Note is a highly affordable Android phone that is perfect for smartphone users that are looking for a relatively cheap phone that comes packed with a bunch of sophisticated features. Its sleek and lightweight design give this Chinese smartphone a high-end and stylish look – fit for any flagship device out there. Running on an Android operating system, this 5-Inch smartphone comes packed with all the trusted features that are well loved by millions of Android users. With its fast and sturdy performance, this Android smartphone certainly is a phone that brings along a great user experience – truly making it a feast to use regardless the type of smartphone user you are. With its Full-HD 5.5-Inch display, this Android smartphone is capable of portraying all your favorite media in stunning beauty and vivid color. Watching movies and playing games on your smartphone has never been more exciting as, with the Meizu M3 Note, you’ll be able to enjoy a truly cinematic experience from the palm of your hand. An epic 4100mAh battery brings along excellent battery life – letting you take the most out of all the beauty this Chinese smartphone has to offer for countless hours continuously. Whether you like to enjoy numerous FHD movies from beginning to end, fill your day with online games, or simply browse the web for hours in a row – this Chinese smartphone will get you through the most demanding of days without needing to worry about battery life. Unlike most budget phones out there, the Meizu M3 Note is a highly affordable smartphone that does not only come with a low price tag but also packs some beautiful hardware. Featuring the Heilo P10 MTK6755, this cheap smartphone is capable of tackling demanding games and the latest applications at ease. Built for speed and efficiency, this Octa-Core CPU along with 2GB of RAM handles whatever you throw at it without dropping a frame. With the possibility to extend your memory externally with 128GB, the Meizu M3 Note is a budget Android phone that always holds enough space for you to save all your files and media alike. Simply head out to the Play Store and download the latest games and applications, with this Chinese smartphone at hand you’ll be able to carry along years worth of entertainment and never have to be bored again. Featuring two IMEI numbers, the Meizu M3 Note is an affordable Android phone that allows you to be connected to two 4G network providers simultaneously. By letting you be reachable on two phone numbers while using merely one device, this Chinese smartphone has proven itself perfect to be used for separating work and private life. Additionally, it allows you to be connected to two different 4G providers, immensely increasing your overall data coverage and global connectivity. No matter where you’ll be at, with this 4G Dual-SIM smartphone at your side, you’ll always be within reach to your friends and family back home. The Meizu M3 Note comes with a 12 months warranty, brought to you by the leader in electronic devices as well as wholesale android phones..